Hello everybody, I’m so excited to introduce you to these 3 easy recipes that I learned from Mere Marshall in Rotorua, New Zealand! It was great to visit her because I had been looking forward to meeting her. If you want to know why I think she’s such an inspiring person, please check out her fan page on my website. She invited all her family members and friends over for a big party on the day we filmed. We had a great time! Abalone is known as paua to the Maoris. Paua, which is found off the coasts of New Zealand, is dark green and looks a lot different from the abalone that we see outside of New Zealand. But it tasted exactly like the abalone we all know. The inside of a paua shell looks like colorful jewels. I had paua fritters twice in New Zealand during my visit to Jamie Frater’s house in Wellington and Mere’s house in Rotorua. There are 3 recipes in this video: traditional New Zealand paua fritters, taro chips, and a recipe Mere created: a dipping sauce made with Korean soondubu (soft tofu) and dill leaves. Making a dipping sauce with soondubu was a brilliant idea! How come I didn’t think about this! The dipping sauce is so creamy and flavorful, but not greasy at all because it’s made with soft tofu! It’s also totally vegetarian. I’m sure you will be impressed by the soft creamy sauce, just as I was. The cameraman for this video was Kristian Robin Lomath, a very talented artist and a friend of Mere’s. Thanks for being the cameraman, Kristian! Put all the ingredients except for the vegetable oil into a large bowl. Combine well. Heat up a fry pan and add olive oil. When the oil is hot, place 2-3 tbs amounts of the paua mixture in the pan. Press down a little, keeping them in a round shape. Cook for about 5 minutes per side at medium heat. Place cooked paua fritters on absorbant paper and keep warm while finishing the remaining fritters. Shallow fry the slices in vegetable oil until they are lightly browned and crisp. Serve with pauafritters and tofu and dill cream. This is a very creamy yet light sauce/cream that is nice with both paua and taro chips. Place all ingredients in a food processor. Process until the dill is well combined with tofu. Posted on Tuesday, March 20th, 2012 at 11:52 am. Last updated on April 26, 2015. Posted March 27th, 2012 at 10:51 pm | Log in to reply. Paua fritters looks good and yummy. Very healthy dish and good for pica-pica :). It is okay for a Taco as a substitute?? . Anyway, I will try this at home and definitely my friends would love to try this different dish. Posted April 1st, 2012 at 8:23 am | Log in to reply. Kia ora I think you could use taro in place of tacos. I find it is best to cut the taro very fine or on the finest setting in the food processor. They are more like warm potato crisps -light and crunchy but not as tough as tacos. Parsnips are also delicious done this way too. Hope you will try and enjoy…..
Posted March 24th, 2012 at 3:00 am | Log in to reply. 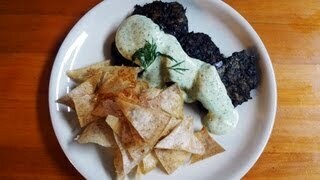 The paua fritters and especially that sauce look so yummy. I don’t think I will be able to get my hands on abalone here, is there anything that I could substitute it with? Posted April 1st, 2012 at 8:00 am | Log in to reply. Kia ora Libelle.I am not sure what you could substitute the paua /abalone with. I have served the sauce with mussel fritters and vegetarian -zucchini pancakes. Of course it is very different from having it with paua -abalone but still very nice. Yesterday we were treated to some West Coast whitebait -a real New Zealand seasonal treat. I think the sauce would be good served with this too or just eat the sauce with the taro chips – that’s a yum combo. Posted April 1st, 2012 at 9:27 am | Log in to reply. Your tofu cream sauce is my favorite these days. Posted May 3rd, 2012 at 5:47 am | Log in to reply. Thanks again, wish you all the best! This recipe was originally posted on March 20, 2012 at 11:52 am by Maangchi. It was last updated on April 26, 2015. The video was watched 72,179 times on YouTube & has 598 likes!